You know those bands and albums that everyone always name checks as being the greatest? That’s what afyccim is all about. Over five years we will listen to 52 of the most influential albums of each era, starting with the 60s in 2012 and finishing up with the 00s in 2016. So that’s one album per week, totalling a mammoth 260 albums over five years. We will listen to not just the albums that were popular in their time, but albums that have changed the course of music and gone on to influence countless musicians that followed. afyccim? What does afyccim even mean? When you have to say ‘a five year crash course in music’ all the time (as we reviewers often do), you soon discover it’s quite a mouthful. 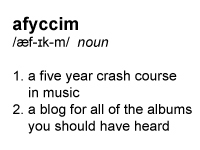 As a result we starting shortening it to afyccim… you pronounce it aff-ik-m. We liked it so much we decided to keep it. afyccim was originally thought up by Ang, who promptly recruited her bff Dann. Ang and Dann worked together in a café in Perth (Western Australia), and were known for annoying all of the staff and customers with their incessant music talk. He was the obvious choice. Next up she called upon her old mate Megan from Queensland, another travelling troubadour who she had met along the way. Megan was known to impress Ang with her vocal stylings and Ang was really excited to have someone to show her favourite music to (and by show I mean force). As a group of frustrated musicians they decided that the last member of their quartet should maybe be a real musician. With bated breath they approached their new Twitter friend Clay, a full-time singer-songwriter from Perth, who had come to their attention whilst listening to and twitter reviewing every Frank Zappa album. The man was made of the gumption they needed. And that’s the way we became the afyccim bunch. Do you guys collaborate on your reviews? In short, no. Basically the first time we see each other’s reviews is at the same time you do, and come Sunday we’re just as excited as you are to see what the other bloggers thought about the album! From time to time you may see us having a 140 character discussion on Twitter but generally we don’t discuss content, in order to ensure that the reviews are wholly our own views and to give you an accurate insight into our true opinion. How many times do you listen to the album? The only rule is you have to listen to the album at least three times over the course of the week. We try to listen to it in different environments as well to get a real feel for it. eg. in the car, on good headphones, while cooking dinner, while juggling on a unicycle, swimming with sharks*, etc. Don’t try this at home, kids! In order to make the list, the album has to rate on all of the above websites consistently. If it shows up in a high place on more than two sites, it makes the preliminary list. Once a preliminary list is made, it is whittled down to 52 based on how prevalent that artist or album was in the musical history of that decade. We’d also like to make it clear that we don’t choose the list based on the artists or albums we like. If they are considered influential they’ve got a chance at being on the list. Where are the lists for the other decades? You’ll get to be involved in making those lists! Each list will be made three months before the start of the next year. We promise you’ll be the first to know. I’m kind of broke. Is it ok to illegally download all of the albums? What are we, your moral conscience? 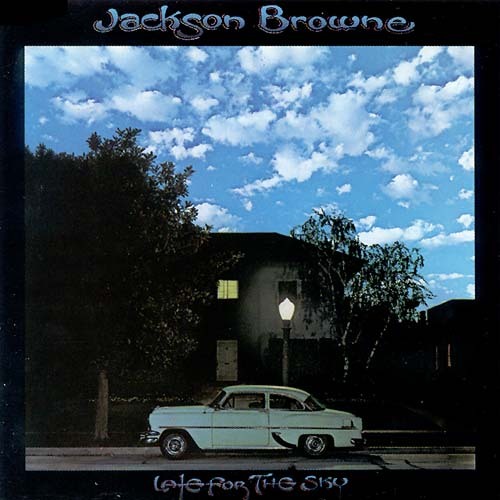 This music is all over the internet and not hard to get, whether you download it, or listen to it for free on sites like lastfm. You lucky buggers in the US of A also get spotify and pandora. Downloading isn’t the only way you can listen to the albums. Score some brownie points by visiting your mum and dad and raid their record collection when they aren’t looking! Sign up to the local library. You could beg, borrow or steal from other people, start a vintage vinyl collection (that’s an investment!) or pick up bargains in the $10 bin at your local CD shop. How about you pay tribute to Steve Jobs by throwing a few bucks onto your iTunes account. Whatever method you choose, just remember to support the artists that you like and actually pay for their stuff. It’ll give you good karma, promise. You guys use some really weird phrases… what do they mean? Back in their days slinging espresso shots together, Ang and Dann would often come up with weird terms to articulate their thoughts on different musical stylings. It has naturally spilled over into the blog, with both Clay and Megan picking up on their use. You are welcome to use them too if you like! I love what you guys are doing! Can I join in on the fun too? Sure! Every year, eight albums will be reviewed by guest reviewers. Send an email to afyccim@gmail.com if you are interested in doing a guest review.